The State Hermitage Museum Official Hotel in St Petersburg only hotel representing a new gateway to experience The State Hermitage Museum in St Petersburg. The values and traditions of the Museum are embedded in all that the hotel represents and offers. The main goal of the concept was to create a link between the Hotel and the Museum, providing Guests with an opportunity not only to see the magnificence of the residence of Russian Emperors and Tsars but also plunge into this magical ambience and live through it. The concept of the design is also supported by other special features, such as for instance menu in the Catherine the Great Restaurant, which has been recreated by the Chef, using the menus served at the Imperial residence itself and crockery manufactured by the Imperial Porcelain Factory – the manufacturer who produced wares exclusively for the ruling Romanov family and the Russian Imperial Court. 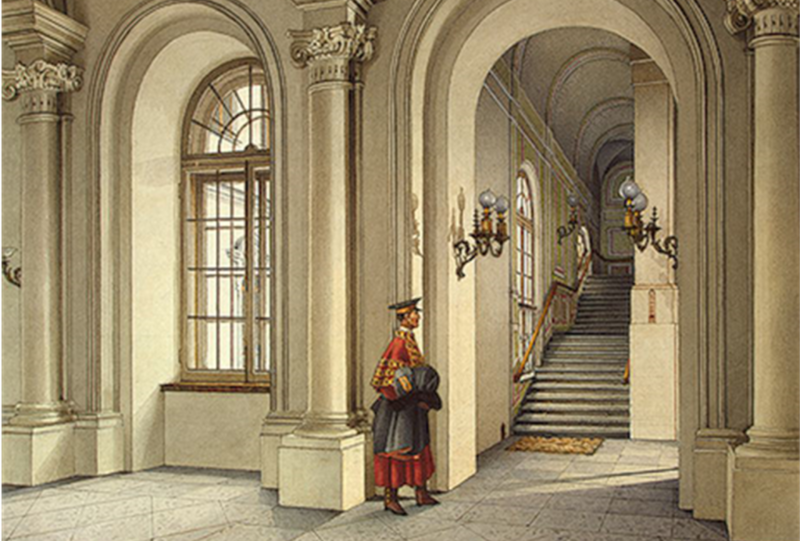 The uniform of the doormen was also sewed basing on the existing costumes of the servants of the Royal family in the Winter Palace. In order to create a feeling of imperial magnificence in internal decoration, furnishing and separate objects of décor were carefully thought through. 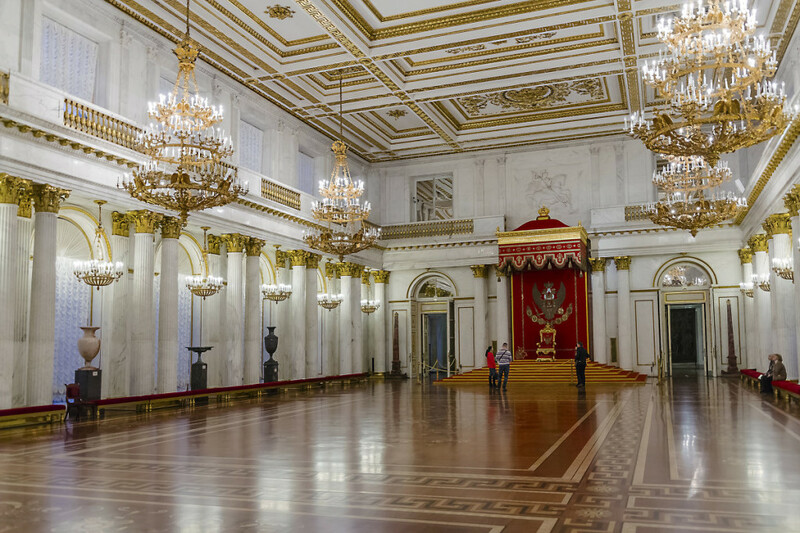 Each element of the interior in the Hotel contains direct or indirect references to internal decorations of the Winter Palace or is a replica of an object, which can be found on the display in the Hermitage Museum. 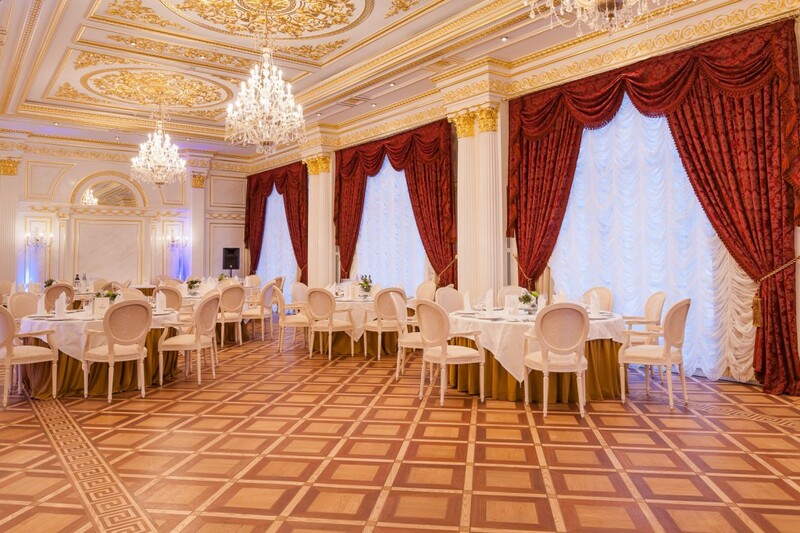 The design of the Rossi Ballroom – the most exuberant event space in the hotel, meant to hold special events, banquets and balls, echoes the internal decoration of the famous Throne Hall in the Winter Palace: paired columns, gold gilded ceiling ornaments, and half round door portals with mirrors. 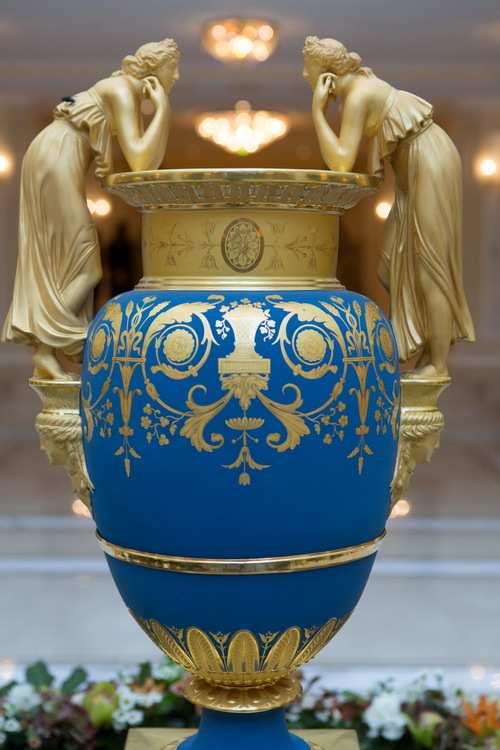 The Vase situated in the center of the Lobby area is a peculiar exhibit, which can be found in one of the halls of the State Hermitage Museum. The original copy of the “Gossips” vase was manufactured in 19th century by the finest masters of Imperial Porcelain Factory in order to embellish one of the chambers that was part of imperial residence back in time. 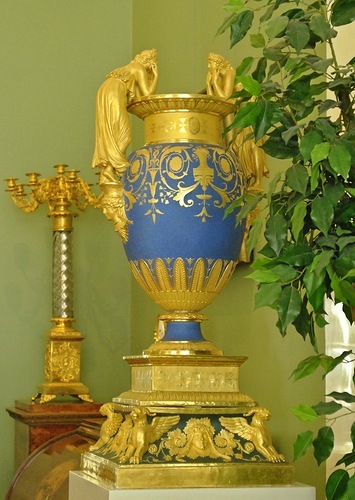 The refined porcelain vase is executed in blue color and is decorated with hand crafted golden sculptures. Over 200 years later The Imperial Porcelain Factory decided to manufacture a unique replica of the famous vase, which was then obtained by the Hotel in order to put it on the display for the Guests of the Hotel. Complimentary Shuttle to the Museum. The 5-star Hotel in St Petersburg – The State Hermitage museum Official Hotel is conveniently located in the heart of Dostoyevsky’s historical neighbourhood, where some of the most famous novels of the Russian author are enacted. From the hotel, you will be shuttled directly to The State Hermitage Museum in St Petersburg in a matter of minutes on our free service, which runs permanently during the Museum’s working hours. Vladimirskaya Cathedral, the museum in Dostoyevsky’s House and Nevsky Prospect are within walking distance. The latter holds the crème-de-la-crème of global luxury brand boutiques. Close to water channels of the Venice of the North, the hotel also offers romantic and informative boat tours of the city. The State Hermitage Museum Official Hotel in St Petersburg encompasses 126 rooms, all at 5-Star specification, over six floor. The rooms, whilst luxurious and spacious, have full connectivity for your technology needs. The ambience, décor and fittings of the hotel and rooms are classical and sympathetic, yet refined, fully in keeping with The State Hermitage Museum heritage in St Peterburg. Pushkin Village and Ekateriniinsky Park.